Calculate the cooking time, allowing 15 minutes per 450g plus an extra 15 minutes. Preheat the oven to 220c/425f/ Gas 7. Season the gut cavity of the chicken with salt and pepper, and stuff a handful of herbs, lemon or garlic if you wish. Keep the bird in a compact shape by pulling the legs close in to the bird and tying them together. 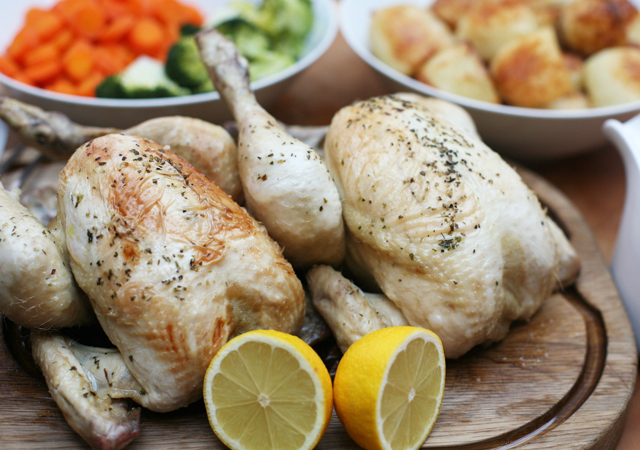 Put the chicken into a small roasting tin and rub all over with a little softened butter or olive oil. Season well on the underside with salt and pepper, slide into the oven and roast for 15 minutes. Then lower the oven temperature to 190c/375f/Gas 5. and roast for the remainder of the calculated cooking time. Remove the chicken from the oven, lift it onto a board and cover with foil. Leave for 10-15 minutes before carving.